This past January the museum acquired through Sotheby’s an important nineteenth-century Kongo Power Figure, created by the Kongo Peoples who inhabit the Congo River estuary region along the Atlantic coast of Central Africa. Today the area is shared by the Democratic Republic of the Congo, Republic of the Congo, and the Cabinda province of Angola. Standing just over twenty-four inches high and carved of wood, figures such as this fulfilled a religious role in Kongo communities. Hallmarks of these figures are their accumulations of inserted nails, metal adornments hanging from the waist, and a container on the chest, which formerly held consecrated matter associated with their ritual use. The inserted nails served an important role, such as memoranda of important vows, the sealing of covenants, or deterrents to crime. 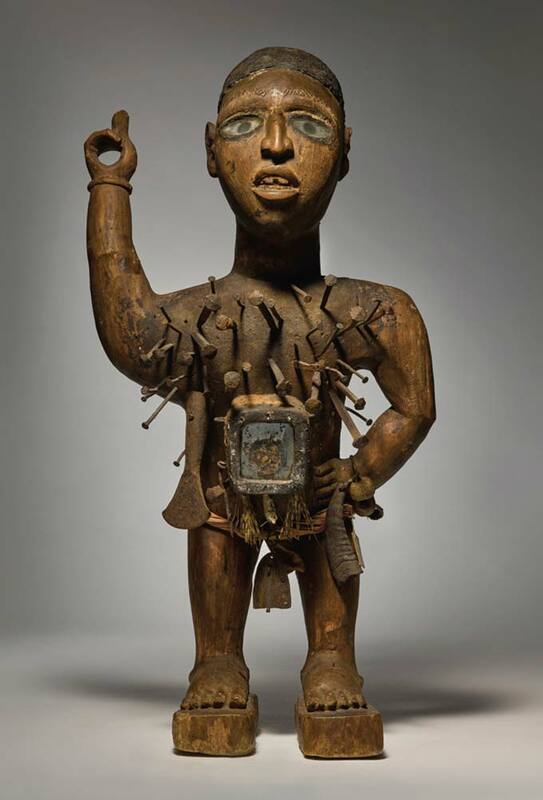 As Alisa LaGamma, curator of African art at the Metropolitan Museum of Art, wrote in the introduction to her exhibit preview Kongo: Power and Majesty (2015), “In the Western imagination, the electrifying aesthetic of multimedia Kongo power figures has become synonymous with African art.” While the exhibit goes on to explain why this superficial familiarity reflects a fundamental misunderstanding of the role of these figures, they nevertheless are among one of the most important genres of carvings associated with Kongo society. An important aspect of this particular power figure is its distinguished provenance. It was acquired sometime in the late nineteenth century by Robert Visser, a German businessman who worked for a Dutch trading company. Visser settled permanently in the Loango region and spent more than twenty years in the area. He returned to Germany in April 1904 along with more than 1,000 objects he collected during his time in Loango, which he donated in several installments to the Ethnologisches Museum, Berlin, the Museum für Völkerkunde, Leipzig, and the Linden-Museum, Stuttgart. This sculpture bears a paper accession tag from the Linden-Museum along with a painted museum accession number. It was sold by the Linden-Museum sometime in the 1960s to raise much needed funds in the decades following the Second World War. The sculpture will go on view in January 2019 as part of an exhibit celebrating fifty years of collecting art for Middlebury College.